With something like 900 churches, chapels, and oratories in Rome, I could visit one a day and still have a long way to go by the time I graduated. However, since we have our community Eucharist weekly in the Lay Centre, I am trying to spend Sunday worship somewhere different each week to continue getting a sense of the Church, both Roman and catholic. This Sunday I joined some friends who are regulars at the parish church of Santissima Trinità dei Pellegrini (Most Holy Trinity of Pilgrims). 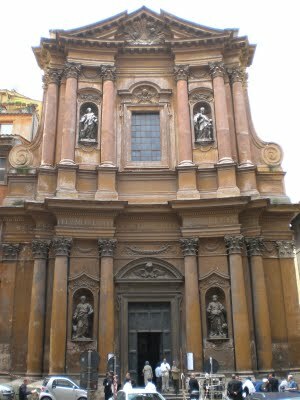 Trinità is the personal parish in Rome for the extraordinary form of the Roman Rite, more commonly called the Tridentine Rite. It is staffed by the Priestly Fraternity of St. Peter. Just as the liturgy was renewed in 1970 by Paul VI in accordance with the Vatican II Council, so it was after the Council of Trent when Pius V promulgated the Roman Missal of 1570. “Tridentine” simply means “of Trent”. The latest of several revisions to this liturgy of Trent was made by John XXIII in 1962, and it is that version which was approved by Benedict XVI on 7.7.07 for use as the extraordinary form of the liturgy. At one level, I was not sure what to expect. I am too young not only to have missed being formed by this liturgy and the concomitant devotions and ‘Catholic ghetto’ identity, but I also missed the most tumultuous years of peri- and post-Conciliar development, changes, and even occasional abuses. I simply do not have a neuralgic response to either the Tridentine liturgy or to the phrase “Spirit of Vatican II” as do so many of my older colleagues of different generations. Some experiences I have had did lead to some expectations, some of which were confirmed and some of which were totally blown away. While this was my first experience with a “high mass” according to the extraordinary form, it was neither my first Tridentine nor Latin liturgy. 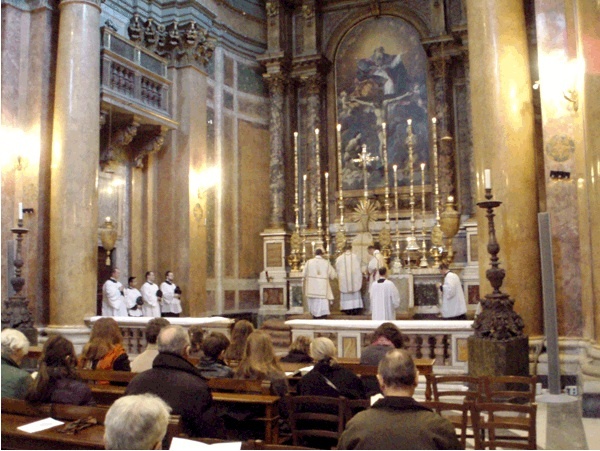 While I have participated in some beautiful liturgies in Latin before, they were all according to the normative Roman Rite – in other words, the same mass we celebrate every Sunday in English, Spanish, Italian, etc. My (admittedly few) previous experiences of the Tridentine form could not be described, by any stretch of the imagination, as beautiful. In fact, they could hardly be described as liturgy: terrible music, if any, nothing resembling “full, conscious, and active participation” by the assembly, and a vapidity so pervasive that the sacramentality, spirituality, and genuine reverence for the Eucharistic liturgy was almost totally lost. In at least one case the priest’s Latin was so bad the actual validity of the consecration was called into question. Each time it seemed more about making a ‘political’ statement in the culture wars than in actual worship or an act of communion. Given the people who invited me, however, I was confident that this would not be a repeat of those experiences, whatever it turned out to be. As it turned out, that involved both beauty and illumination. Gregorian and other chant done well – the music was beautiful. My rusty Latin was enough to know what part of the mass I was in, and to sing along with some of the mass parts, but mostly it was enough to just listen. About one hundred twenty people were there, the median age seeming to be in their early 50’s, with a pretty good mix from two or three small children to people old enough to have been formed in this rite. We had a crowd of about fifteen students from the pontifical universities, most of whom are regulars. I only saw a couple of mantillas in the whole assembly. A small pamphlet had the readings and some prayers in Latin and Italian. The major parts of the mass were recognizable from the current form of the Rite, and from what I remember studying in my Liturgical history courses. Announcements and collections are not much different, though the former came in the middle of mass rather than at the beginning or the end. Having an inaudible Eucharistic canon and to be so far removed from the altar did distract a little from prayer and participation, as did not always knowing when to kneel, stand, or sit or precisely why. Not that I could kneel anyway, there was not room enough! One thing that was consistent with more than a few regular parishes, though, was that everybody seemed to have their own expectations about this anyway, and most of the time about half were kneeling while half were standing. It was not very uniform, but neither did that seem to matter to anyone. Cognitively, I know that the idea of the long nave with a high altar at one end, the presider and other ministers facing ad orientem along with the people is supposed to represent the presbyter leading the people in the sacrifice and their pilgrim journey. I also know that most people experienced this more as a sense of removal and non-participation, of the mass as a private devotion of the priest “over there” while we did our thing “over here”. Personally, it felt neither like I was being led in worship, nor that I was completely removed from the action. As something both deeply familiar and existentially unfamiliar, I guess I was in more of an observer-participant role, a student in prayer. The need for the renewal and reform of Vatican II was made evident to me, on one hand. This is a liturgy pretty far removed from those described in the early church, and not easily accessible for a lot of people, especially if not done as well as it was at Trinità. On the other hand, I could see how it would be a difficult adjustment for people formed by this liturgy to adapt to the current Rite, especially if their experience of the transition was handled badly and without proper catechesis, as seemed to be the case in too many places. In the States, generally, it seems that the Tridentine mass has become little more than a weapon of the culture war, as I mentioned above. “More Catholic than Benedict XVI, more conservative than Pius IX, and holier than Mother Teresa” would be the motto. Probably they are here too, just as the opposite extreme can be found in some other parishes, if one looks hard enough. By A.J. Boyd in La vita Roma on November 17, 2009 .